The Splendid Sampler Block 19 by Jane Davidson from Quilt Jane was released today! It is an adorable pieced block with embroidery named Measure Twice, Cut Once. If you have spent even a week sewing you know that this is fantastic wisdom! Thank you Jane for a fab block! In this house this block will forever be known as the "irony" block. The wisdom of the embroidery was not followed completely and my block is 1/2 inch too narrow. I had this great measuring tape fabric in my stash that was perfect for this block! To make it work where just the measuring tape showed without overlapI had to make it smaller than the pattern was written. I did get it to work, and remembered to add in for the top and bottom but completely had forgotten about the sides! Silly me! The block was made using Moda Mochi linen ( yummy) and the beautiful tape measure that came with a scrap bundle as a bonus ( SCORE)! I pieced using Aurifil 50wt and the embroidery was using six strands of Aurifil floss. To find out more about The Splendid Sampler and join in on the fun of this FREE online quilt along, please visit the website to get your free patterns ( including bonus blocks and projects) read the FAQ, and get started! I love your block! 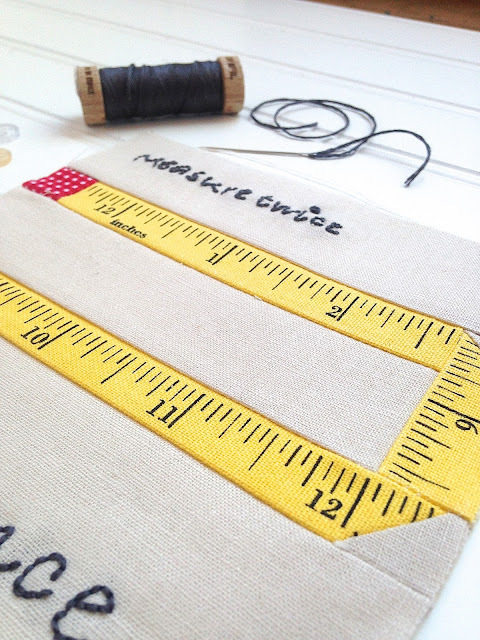 it's so cute and a great way to use that fabulous measuring tape fabric. by the way, you are my pattern winner! 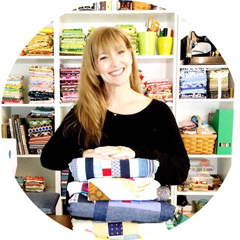 please email me at crazymomquilts@yahoo.com so I can get your free patterns to you! I have rolled up the pieces and kept them together as a group. Have used them for pot holders. But I like the idea of cutting them into different size blocks and storing them by size.